Solar maximum has passed. What climate effects will come next? Austin, January 4, 2015 – Solar maximum activity peaked in April 2014 at an exceptionally low 81.9 spots/day. Waning solar activity in 2015 will begin the long, inexorably journey towards solar minimum over the next half decade or so. 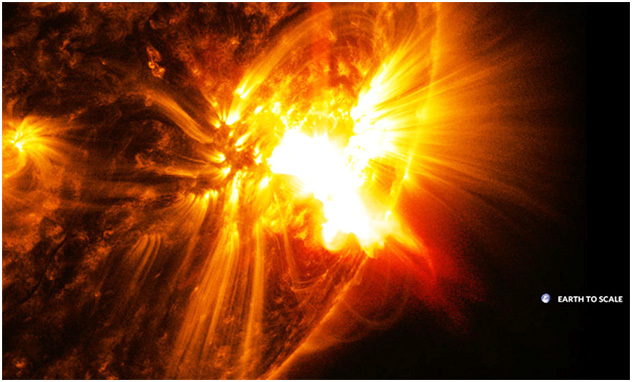 If solar physicists are correct, solar activity could be very low for several decades to come. How that will affect climate change is anyone’s guess, but low sunspot activity has already been identified by the United Nation’s International Panel on Climate Change (IPCC) as one of the main causes for the 15+ year “hiatus” from atmospheric global warming. The Royal Observatory of Belgium released December’s official monthly international sunspot numbers on January 1, 2015. Sunspots increased again in December, but the 13-month smoothed sunspot number that defines solar maximum declined for the 2nd month in a row. Given that solar maximum is a 13-month running average, no one knows maximum has been reached until at least seven months after the fact. What does the downturn in solar activity mean for earth’s long-term climate change? One legitimate comparison of the current situation on the sun is to a cold period on earth called the Dalton Minimum. It happened 200 years ago. 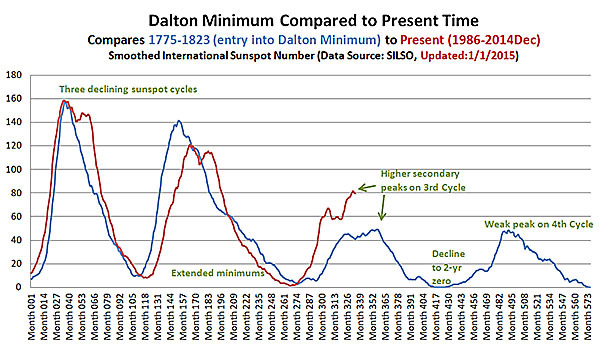 There were three declining solar cycles leading into the Dalton Minimum, just like now. The third exceptionally weak cycle had a rare higher secondary peak than its first when the Dalton was reached, just like now. That cycle was followed by a decline to zero spots. The period of zero spots lasted nearly two years before another weak cycle occurred. The match to current activity isn’t exact, but it’s eerily similar. There is modern supporting evidence that the sun will have an exceptionally weak cycle next time, just like the Dalton. Umbral intensity is a measure of how black the center of the average sunspot is compared to its surroundings. An intensity of 1 means the sunspot is invisible. Sunspots have been fading away since the late 1990s. In the last 3-4 years, though, the fading has leveled off. Umbral magnetic field is a measure of the strength of the average sunspot, measured in Gauss. The lower the number, the weaker the sunspot. Strong magnetic fields are what cause giant solar flares and coronal mass ejections (CMEs) that dramatically affect earth. Sunspots cannot form with a field strength below 1,500 Gauss. In the last 3-4 years the decline in magnetic field strength has leveled off, too. When this data was first published in 2011 it caused quite a stir among solar physicists. 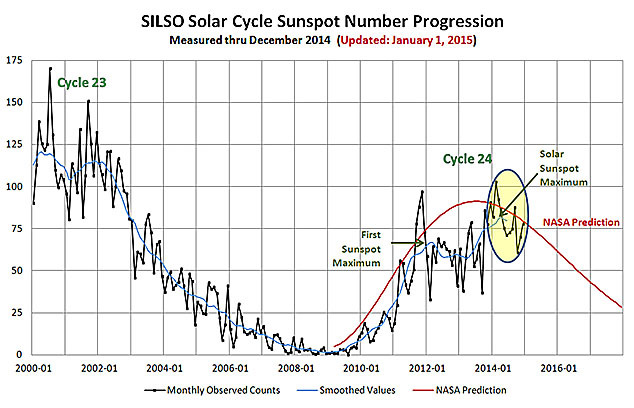 Some predicted sunspots would totally disappear after the current cycle ended. It doesn’t look like that will be the case after all. It looks like the next cycle, Cycle 25, will be another weak one, just like during the Dalton Minimum. 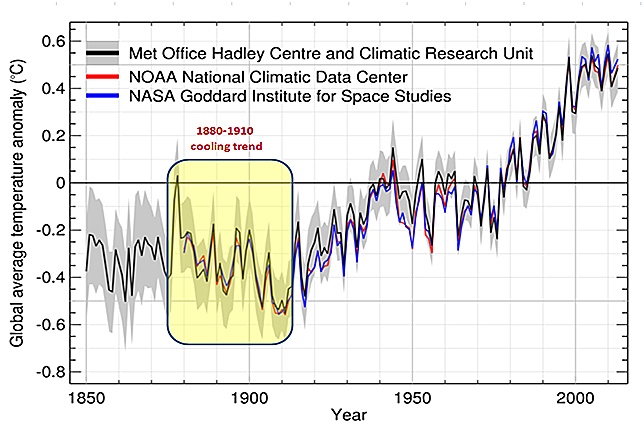 Reliable global temperature data does not extend further back than about 1850, fifty years after the Dalton. However, anecdotal evidence suggests there were very cold winter temperatures in the northern hemisphere during that time period. 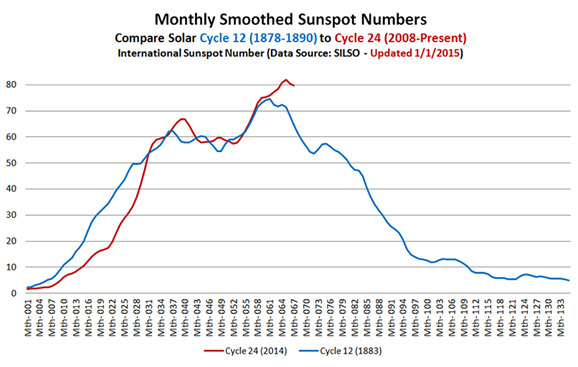 The current sunspot cycle most closely matches Cycle 12, which peaked in 1883. That one is within reliable global temperature records. Both Cycle 12 and the current cycle have a rare secondary peak higher than the first. That has got to mean something. According to IPCC data, the period of the 1880s to the early 1900s was characterized by a general decline in earth’s global atmospheric temperature. Cycle 12 and the two cycles following it were exceptionally weak cycles leading into the early 1900s. It corresponded to declining global temperatures. Coincidence? Not likely. Solar sunspot maximum was reached in April of 2014. That did not become known until recently because solar max is computed as a 13-month running average. You can’t know it has been reached until at least seven months after the fact. There have been two months of decline since then, so it is reasonably certain the maximum was finally reached. As it is, it was over two years later than originally predicted. If the current cycle follows past solar behavior then 2015 will see a steep decline in solar activity as it progresses toward solar minimum in the next five years or so. The current cycle (Cycle 24) has strong similarities to both the Dalton Minimum and Cycle 12 that peaked in 1883. Both time periods are associated with cold earth temperatures. Cycle 12 is more meaningful because it is supported by current United Nations IPCC data. That being the case, it’s time to start thinking about breaking out the cold weather gear. ’m inclined to take his forecasts seriously. Russian scientist to alarmists: ‘Sun heats Earth!’ 20 May 10 – CHICAGO – Habibullo Abdussamatov, head of space research at Pulkovo Astronomical Observatory in St. Petersburg, Russia, predicts that a new “Little Ice Age” could begin in just four years. I sat just ten feet away from Abdussamatov as he made this startling assertion at the Heartland Institute’s 4th International Conference on Climate Change in Chicago just two days ago. Jerome R. Corsi from World Net Daily covered the proceedings exceedingly well, and I am quoting or paraphrasing him extensively here. In a two-part video recorded at the conference by WND (link below), Abdussamatov explains that average annual sun activity has experienced an accelerated decrease since the 1990s. 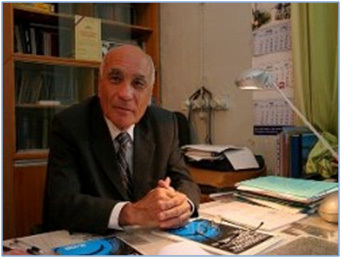 Abdussamatov argues that total sun irradiance, or TSI, is the primary factor responsible for causing climate variations on Earth, not carbon dioxide. Abdussamatov pointed to the English astronomer Walter Maunder, who noticed that sunspots had been generally absent from 1645 to 1715. That period coincided with the middle and coldest part of the Little Ice Age (see article D, below), which began around 1650 and extended through 1850. “The observed global warming of the climate of the Earth is not caused by the anthropogenic emissions of greenhouse gasses, but by extraordinarily high solar intensity that extended over virtually the entire past century.” “Future decrease in global temperature will occur even if anthropogenic ejection of carbon dioxide into the atmosphere rises to record levels. I have the utmost respect for the courageous scientists who presented at this convention. Western Europe experienced a general cooling of the climate between the years 1150 and 1460 and a very cold climate between 1560 and 1850 that brought dire consequences to its peoples. The colder weather impacted agriculture, health, economics, social strife, emigration, and even art and literature. Increased glaciation and storms also had a devastating effect on those that lived near glaciers and the sea. Lamb (1966) points out that the growing season changed by 15 to 20 percent between the warmest and coldest times of the millennium. That is enough to affect almost any type of food production, especially crops highly adapted to use the full-season warm climatic periods. During the coldest times of the LIA, England’s growing season was shortened by one to two months compared to present day values. The availability of varieties of seed today that can withstand extreme cold or warmth, wetness or dryness, was not available in the past. Therefore, climate changes had a much greater impact on agricultural output in the past. Fig. 16 and 17 show the price of wheat and rye, respectively, in various European countries during the LIA. Western Europe experienced a general cooling of the climate between the years 1150 and 1460 and a very cold climate between 1560 and 1850 that brought dire consequences to its peoples. The colder weather impacted agriculture, health, economics, social strife, emigration, and even art and literature. Increased glaciation and storms also had a devastating affect on those that lived near glaciers and the sea. 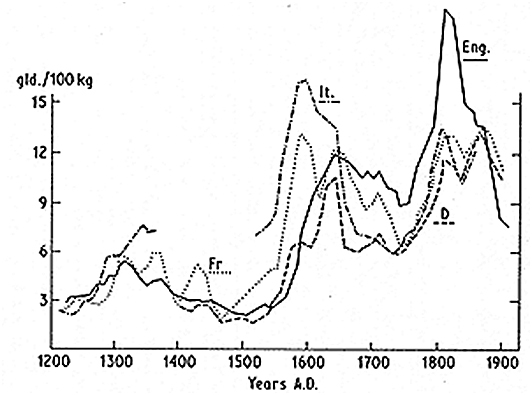 The cooler climate during the LIA had a huge impact on the health of Europeans. As mentioned earlier, dearth and famine killed millions and poor nutrition decreased the stature of the Vikings in Greenland and Iceland. Malnutrition led to a weakened immunity to a variety of illnesses. In England, malnutrition aggravated an influenza epidemic of 1557-8 in which whole families died. In fact, during most of the 1550’s deaths outnumbered births (Lamb, 1995.) The Black Death (Bubonic Plague) was hastened by malnutrition all over Europe. You are so very choleric of complexion. Beware the mounting sun and all dejection, Nor get yourself with sudden humours hot; For if you do, I dare well lay a groat That you shall have the tertian fever’s pain, Or some ague that may well be your bane. In sixteenth century England, many marshlands were notorious for their ague-stricken populations. William Shakespeare (1564-1616) mentioned ague in eight of his plays. Oliver Cromwell (1599-1658) died of ague in September 1658, which was one of the coldest years of the LIA. Conditions during the LIA led to many cases of social unrest. The winter of 1709 killed many people in France. Conditions were so bad, a priest in Angers, in west-central France, wrote: “The cold began on January 6, 1709, and lasted in all its rigor until the twenty-fourth. The crops that had been sewn were all completely destroyed…. Most of the hens had died of cold, as had the beasts in the stables. When any poultry did survive the cold, their combs were seen to freeze and fall off. Many birds, ducks, partidges, woodcock, and blackbirds died and were found on the roads and on the thick ice and frequent snow. Oaks, ashes, and other valley trees split with cold. Two thirds of the vines died…. No grape harvest was gathered at all in Anjou…. I myself did not get enough wine from my vineyard to fill a nutshell.” (Ladurie, 1971) In March the poor rioted in several cities to keep the merchants from selling what little wheat they had left. Lamb (1995) reports the occurrence of cattle raids on the Lowlanders by Highlanders who were stressed by the deteriorating climate. In 1436, King James I of Scotland was murdered while hunting on the edge of the Highland region near Perth. The clan warfare grew so bad that it was decided that no place north of Edinburgh Castle was safe for the king so Edinburgh became the capital of the country. In England, the effect of starvation and the poor condition of the country encouraged men to enlist during the War of the Roses (1455-1485.) As tillable land was converted to other uses such as sheep rearing, the landlords who organized the conversions became the focus of many hostilities. One group in particular suffered from the poor conditions – people thought to be witches (Behringer, 1999.) Weather-making was thought to be among the traditional abilities of witches and during the late fourteenth and fifteenth centuries many saw a great witch conspiracy. Extensive witch hunts took place during the most severe years of the LIA, as people looked for scapegoats to blame for their suffering. One of history’s most notorious quotes might have been due in part to a rare extremely warm period during the LIA. In northern France in 1788, after an unusually bad winter, May, June, and July were excessively hot, which caused the grain to shrivel. On July 13, just at harvest time, a severe hailstorm (which typically occurs when there is very cold air aloft) destroyed what little crops were left. From that bad harvest of 1788 came the bread riots of 1789 which led to Marie Antoinette’s alleged remark “Let them eat cake,” and the storming of the Bastille. 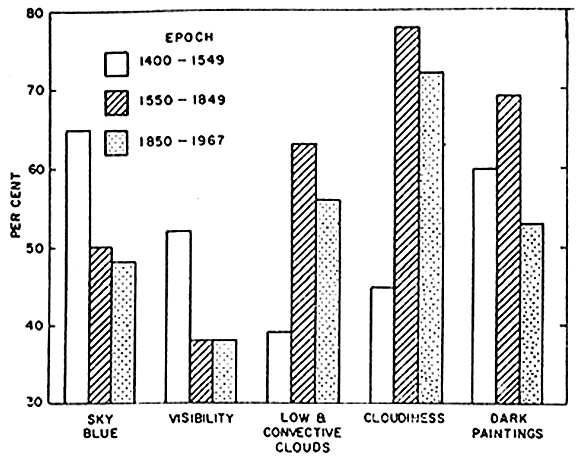 Neuberger (1970) studied more than 12,000 paintings in 41 art museums in the United States and eight European countries to test his hypothesis that paintings would accurately reveal the climate record. These paintings covered the period from 1400 to 1967. He categorized the blueness of the sky into a three-step scale consisting of pale blue, medium blue, and deep blue. Cloudiness was estimated according to the U.S. airways code: clear (less than 10 percent coverage), scattered (10 to 50 percent), broken (60 to 90 percent), and overcast (more than 90 percent cloud coverage.) In addition, the types of clouds were observed according to four families: high, middle, low, and convective (vertically-developed) clouds. Neuberger separated his data into three epochs. According to the data in Fig. 19 below, during the second epoch when the LIA was at its peak, cloudiness and darkness prevailed. Neuberger suggests that the similarities between the second and third epochs have more to do with a stylistic change in the third epoch to impressionism which produced hazy atmospheres and also to an increase in industrial pollution. Fig. 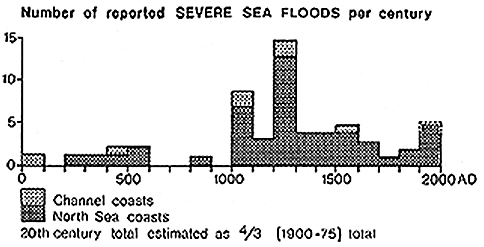 20 shows the number of reported severe sea floods per century in the North Sea region. During the LIA, there was a high frequency of storms. As the cooler air began to move southward, the polar jet stream strengthened and followed, which directed a higher number of storms into the region. At least four sea floods of the Dutch and German coasts in the thirteenth century were reported to have caused the loss of around 100,000 lives. Sea level was likely increased by the long-term ice melt during the MWP which compounded the flooding. Storms that caused greater than 100,000 deaths were also reported in 1421, 1446, and 1570. Additionally, large hailstorms that wiped out farmland and killed great numbers of livestock occurred over much of Europe due to the very cold air aloft during the warmer months. Due to severe erosion of coastline and high winds, great sand storms developed which destroyed farmlands and reshaped coastal land regions.